Welcome to Dancing on the Shore! We offer professional, high quality ballroom and latin dance instruction throughout the Eastern Shore. Our instructors are former competitors / performers and are certified professional teachers. Instruction includes both International & American style ballroom dance at all levels. 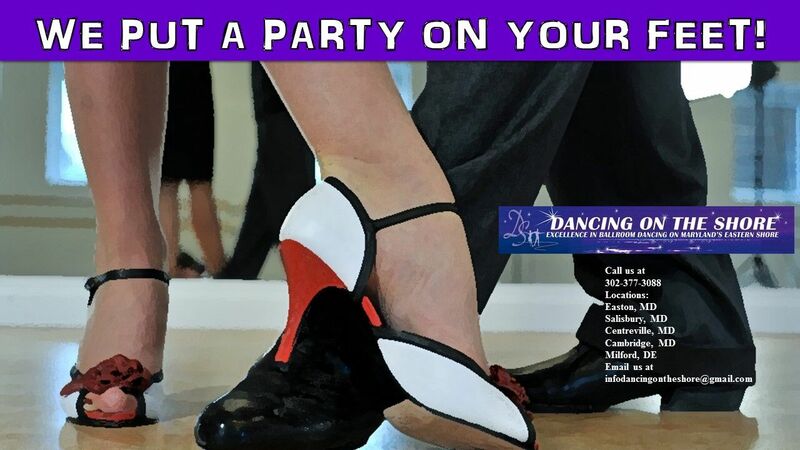 We also offer classes in Waltz, Tango, Foxtrot, Viennese Waltz, Quickstep,Rumba, Cha-Cha, Samba, Paso Doble, Mambo, Bolero, Jive, East Coast Swing, West Coast Swing, Single time Swing, Polka ,Argentine Tango, Salsa, Bachata, Hustle, Nightclub Two-Step, Country Two-Step and Ballroom Line Dancing. We are now also offering Country Couple Dancing as well! We proudly teach the DIVIDA American style and ISTD international style syllabuses. Classes are currently taught in Easton, Cambridge, Salisbury, Centreville, Ocean City, MD, Milford, DE, Lewes, DE and Dover, DE.